Thursday saw the return of the eagerly anticipated El Capote evening of food and wine matching. Before anyone gets upset that I didn’t tell them about it – I had been invited along by Ian at the last minute, it was a small gathering of us and once again it did not disappoint. This time around the menu was Japanese/Mediterranean fusion menu. Normally, fusion cuisine is cuisine that combines elements of different culinary traditions. This was perhaps not so much fusion cuisine as a fusion concept. The food which was delicious, was the type of cuisine served by El Capote but presented in alternative ways, aiming to represent Japanese cuisine. that with a product this good, the less you do to it the better. And Ian knows how to get the best out of his product. A quick flash fry on the hot plate and served with caramelised onions. Showing a level of innovation in the kitchen, the Calamares were rolled into the shape of California Rolls and filled with sticky, plummy, jammy, caramelised onions. The idea being that the Calamares’ white flesh represented the rice and the caramelised onions the salmon/tuna in the roll itself. Sadly, and you could see Ian’s enthusiasm for this dish deflate, as the Calamares did not retain their round shape. As on the flesh touching the heat of the hotplate, it just opened out spilling its onion insides. But this dish was sublime. Served with a fruity Sauvignon Blanc to echo the sweetness of the dish. This was a winning dish! 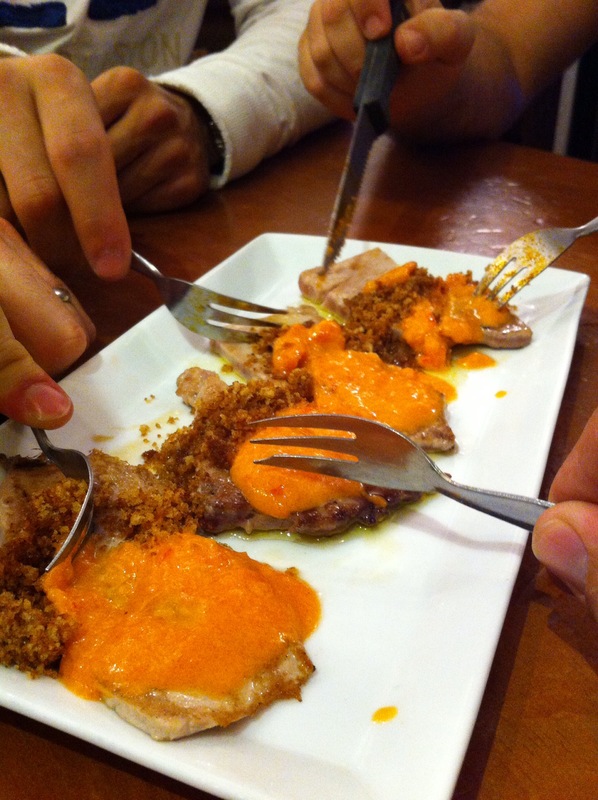 Galicia’s signature dish served as if taken out of a Japanese cookbook. 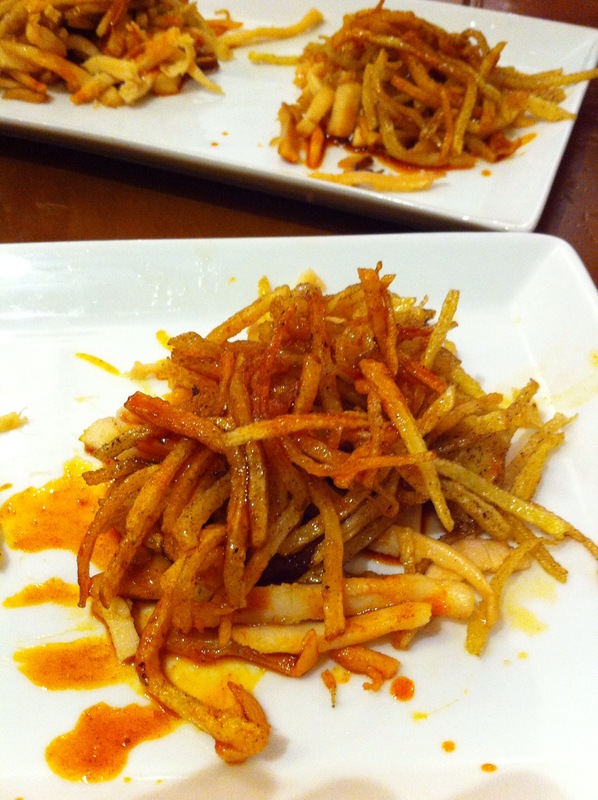 The octopus served in thin strips with thin chips (fried in oil!) and mixed with the characteristic pimienton of Pulpo a la Gallega. Each diner was presented with their own individual nest of chips and octopus to savour. As the idea was that the strips of potato and octopus were meant to represent noodles, I would have attempted to serve the dish in little bowls to try and recreate the noodle experience. But having said this, ‘noodles’ a la Gallega was a flavoursome dish that was brilliantly accompanied by a Penfold Shiraz. The complexity of spices in the Shiraz enhancing the pimienton in the dish. I could have easily eaten another of these nests washed down with more of the Penfold. Roughly translated as bread with olive oil it can also have tomato sauce. This is traditionally a peasant dish of bread rubbed with garlic and olive oil and topped with tomatoes and seasoning. Usually served as an appetiser or tapa, this can also be a great breakfast (my Friday breakfast of choice). However, Ian served this over tuna steaks – gorgeous! The bread, garlic and olive oil fried/oven toasted added texture and crunch to the otherwise delicate tuna and tomato. Served rare (some pieces needed to be even more rare) but with thin tuna steaks this is a hard one to time when cooking on a large scale. My solution was thicker steaks. The only part of the combination which tasted/sounded Japanese, was the wine “Hito.” Served slightly chilled, this red was subtle and carried the flavours in the tuna pan amb oli without necessarily taking over the dish. Hito, is a new young wine of the Emilio Moro, Cepa21 range. I have tried this wine before and thoroughly enjoyed it, however, several people at the table were put off by the idea of a chilled red. What are your thoughts on this? This beautiful thinly sliced blue beef was exquisite. Seared on the outside, each slice of beef boasted a quiveringly rare centre encased in a charred crust. Reminiscent of a beef carpaccio but slightly thicker and with more texture and depth of flavour. 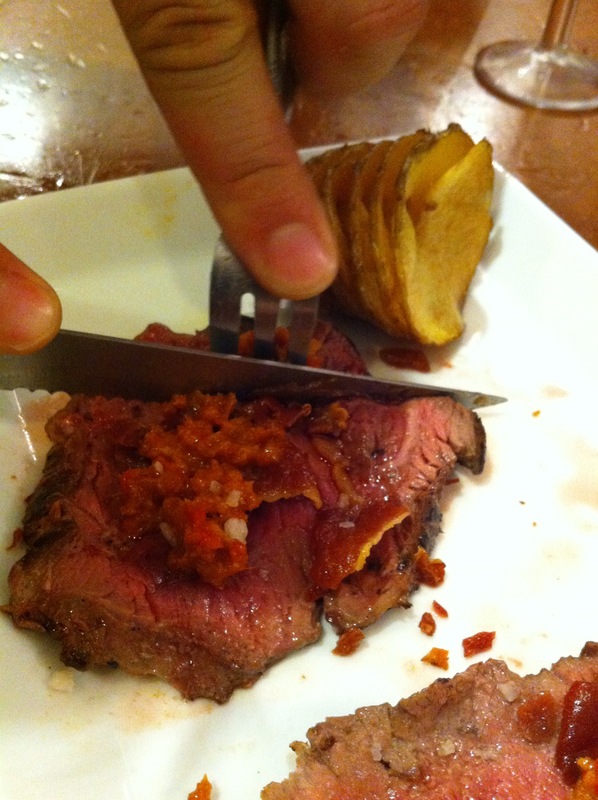 Served with roasted red peppers and fried Jamon de Bellota crumbled on top. The roasted red peppers adding a sweet jous and the fried jamon providing a necessary seasoning to the meat; under-seasoned meat is vile. The Septima Malbec was a good choice of wine to accompany this dish – it stood up to it but let the fillet and its jamon-seasoning do the talking. We ended the evening with a Reserve Chedder Cheese and blue cheese with crackers and a Special Ruby Port. Neither Mediterranean nor Japanese but a worthy ending to the evening. Especially as the port kept coming!! “Hi Ian, checked out Gastrorob. Glad it turned out to be a great evening and everyone enjoyed the marriage of food & wine. Rob’s blog made some very interesting reading and I can understand some people’s reluctance in being served chilled reds but in certain instances and with some grape varieties it does give it the perfect balance to suit the food.